A well-furnished apartment in a private area close to the center. 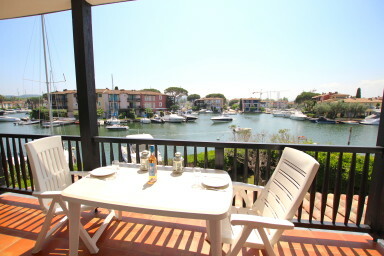 Pretty apartment in the private disctrict of Port Grimaud 1. It is about 5-minutes away from the center and less than 10 minutes from the beach by walk. It is composed of a living room with a well furnished open kitchen and a sofa-bed, one bedroom with a large bed and a shower-room. On the canal side, a wide South-West oriented balcony with a beautiful view on the canal and the surrounding hills.